A concept drawing of the cross monument. The council refused the application for planning approval on the grounds it was inconsistent with its Main Roads Third Party Advertising Signs local planning policy and it was not considered to have any distinguishing or extenuating circumstances that would justify a departure from the policy. According to the council, given its size and proximity to a range of existing private, third party, tourism, directional and other signage, it would result in an unacceptable impact on the area and approval would create an undesirable precedent. A similar proposal by the applicant was refused in June 2012 as inconsistent with the planning policy for Kwinana Freeway/Forrest Highway. 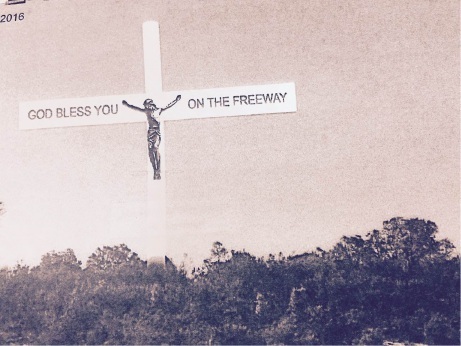 The cross, built in steel and bearing the words ‘God Bless You on the Freeway’, was assessed by council officers as advertising signage. The applicant contended the signage would promote a safe driver message and be of commuter benefit. The council said it had experienced significant pressure for third party signage along Kwinana Freeway/Forrest Highway since it opened to traffic in 2009.